The 2008 growing season was a bad time to be a conifer in Iowa. The Iowa State University Plant and Diagnostic Clinic was inundated with suffering conifers from windbreaks, commercial landscapes, and backyards. What happened? Rain is what happened: too much of it. The six months from January through June saw record rainfall totals in Iowa – the most since record-keeping began in the 1850s. Late May through mid-June was especially sodden, as much of the state saw damaging floods. The result was wet soils, week after week. What’s wrong with lots of water in the soil? After all, trees need plenty of water to stay healthy. But 2008 was a case of too much of a good thing. During the seemingly endless rains of May and June, soils in much of the state became saturated with water – and stayed that way. Even when trees weren’t engulfed in floods or giant puddles, they were rooted in sodden soil. When soil is saturated, the normally air-filled spaces become water-filled instead. This profoundly changes the roots’ environment. Roots get almost all their oxygen by absorbing it from the soil, and the soil oxygen is replenished from the atmosphere. Once soil water replaces soil air, the ballgame changes. Water carries only a tiny fraction of the oxygen found in the air. In prolonged periods of saturation, that smidgen of oxygen is further siphoned off by soil microorganisms. Faced with oxygen starvation, roots begin to slow their activity. Tree roots, like people, go into distress pretty rapidly when their oxygen is cut off. In extreme cases like 2008, the roots can die. The first roots to bite the dust (or mud) are the ones that work the hardest: the tiny roots that do most of the work absorbing water and nutrients from the soil. As a last gasp, some roots start making their own alcohol; this can be a fatal goodbye party, since alcohol also poisons the roots. Damage to conifers was extremely varied. Common symptoms included dead branch tips, yellowed needles, top dieback, and dieback of scattered branches. Some fungal diseases were stimulated by all the rain, too, but the vast majority of the conifer problems had a physical cause – root damage due to low-oxygen stress. Often, the problems showed up in late July or August, even though the worst of the wet spell was long gone. Why the delay? A tree can tolerate some level of root damage. But in warm, dry spells in mid- to late summer, trees call for water to stay cool. If the roots are damaged, the tree can’t take up water fast enough to avoid overheating, and the foliage overheats. So spring’s root damage became summer’s fried foliage. How come conifers got nailed worse than broad-leaved trees? Most conifers hate wet feet, and the longer the soil stays saturated, the worse they do. At the ISU Clinic, we saw hundreds of samples and photographs of damaged blue and Black Hills spruce, white fir, arbor vitae, and other species. On the hopeful side, most of these damaged conifers are not at death’s door. For many, the prospects of eventual recovery are good – as long as the weather cooperates a bit. Meanwhile, avoid the temptation to help nature along by fertilizing, since you are likely to harm rather than help the tree’s recovery. Watering should be done only when the soil is dry, and should add only one inch of water (rain included) per week. With luck and patience, 2009 will return us to green conifers instead of brown ones. I’m having my first experience today as a scribe for the Master Gardener, answering questions for our Horticulture Hotline. We received a plethora of questions, for example, “Can I still spray for weeds now?” and “Explain what my soil test results mean and “How do I get grass to grow under my Linden tree?” What an intriguing and educational two hours it was! From 10:00 to Noon Monday through Friday (winter hours/hours extended to morning and afternoon in the summer) you can speak personally with a Master Gardener at the Extension Office or call the Hort. Line at 319-447-0647, visit about any gardening question and hear a research based answer. Now that we‘ve had a good hard frost, we’re going back to Central Standard Time and the lawn mower is stashed away, what are you going to do? Well, I just bought my 2009 planner and my first notation is jotting down the date of the Master Gardeners’ Winter Gardening Fair scheduled for Saturday, February 7, 2009 at the beautiful new Kirkwood Center for Continuing Education. You and your friends and family can spend the day at gardening classes of your choosing plus listen to an outstanding keynote address by landscape designer and author Janet Macunovich presenting Continuous Color in the Landscape. Your registration fee includes your session classes, Janet’s energetic and practical presentation AND lunch! More information will be available in December with the registration deadline in January. Plan to attend! The Iowa State University Extension 2009 Garden Calendar is available. This large calendar provides eight timely gardening hints each month in addition to wonderful pictures. It’s available for a nominal fee at the Linn County Extension Office at 3279 7th Ave. in Marion. A Master Gardener offered up a great organizational hint today and one my grandkids could be involved in: she’s putting up a peg board in her garage and hanging up all of the tools. (This is where the kids come in), she (or the kids) will draw around each tool with paint so she will know where each tool should be and which ones weren’t put away properly. Can you imagine how Catie and Charlie could be all over Daddy about keeping the garage neat and orderly? You can win with composting in more ways than one. The practice of composting benefits the environment by keeping organic materials out of the landfill and benefits your soil by adding enriching nutrients that are in the compost. Now, composters can win in another way. Just tell us, in 200 words or less, how and why you like to compost and you could win a kitchen composting package, courtesy of the Cedar Rapids/Linn County Solid Waste Agency. 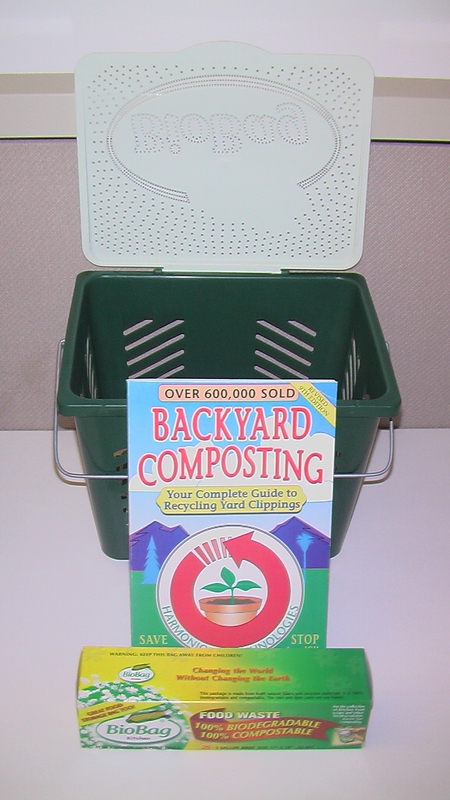 The package includes a “Backyard Composting” book, kitchen compost pail and package of Biobags. Deadline is Nov. 4 — Election Day. Essays must reach us by that day. Send your submission by mail to: The Gazette, attention: Cindy Hadish, newsroom; 500 Third Ave. SE, Cedar Rapids, Iowa 52406. Judges are Bev Lillie, Linn County master gardener coordinator; Dustin Hinrichs, Linn County Public Health air pollution control specialist and Stacie Johnson, education coordinator for the Cedar Rapids/Linn County Solid Waste Agency. Stacie provided the prize. I’m letting the judges decide the criteria. Please include your name, address and phone number on your entries. Also, include “Compost contest” in the subject line of your email. Your address and phone will not be published, but I would like to post the essays, with names, after the contest ends. The winner will be announced Nov. 15, on America Recycles Day. The Iowa Wine Trail welcomes Wide River Winery of Clinton as its newest member. Wide River Winery together with the seven other member wineries invites wine enthusiasts to celebrate Iowa-made wines, paired with heirloom cuisine during their annual fall event. The Holiday Wine & Food Weekend runs Saturday and Sunday, November 1-2, 2008 from 10 am to 5 pm both days. Each winery will offer ticketholders unique family recipes paired with equally unique, locally-made wines. Tickets for the weekend event may be purchased in advance for $25 each or for $35 each on the day of the event. Single day tickets are also available for $20 each in advance, and $30 the day of the event. Visitors who attend all eight wineries during the weekend will be included in a drawing for special door prizes. To purchase tickets, visit any of the Iowa Wine Trail wineries, or call 563-557-3727 or go online to www.iowawinetrail.com. Each winery has special food and wine pairings. Some of the treats to look forward to include: Eagle’s Landing Winery of Marquette offers Grandpa’s Reserve white wine paired with a third-generation recipe, Grandma Millie’s Famous Refrigerator Rolls. Sutliff Cider Company of Lisbon will share specialties including Sweet Potato Ravioli with hazelnut brown butter & herb sauce and cider donuts. Tabor Home Vineyards & Winery of Baldwin pairs onion soup with your choice of their Iowa Lacrosse or Iowa JackSon Red. Wallace Winery of West Branch will suggest a match between Iowa ham and Iowa Barn Red wine. Anamosa’s Daly Creek Winery & Bistro invites visitors to sample Czech Stuffed Mushrooms and Grape Kolaches with some of their distinct wines. The Iowa Wine Trail is a cooperative group of wineries of the Upper Mississippi River Valley wine region, which is currently being considered for American Viticultural Area designation. Busy morning today. A friend came out to “scoop poop”. Actually, he used the skid loader. He took a pickup load of horse manure. He’s spreading that Black Gold on his garden in preparation for next spring’s vegetable garden! How do you know if your soil needs enhancement? For a small fee, you can always obtain a soil testing kit from the Linn County Extension office. And, check for earthworms. In any hole of one cubic foot, you should see at least five earthworms. Earthworms aerate the soil and add considerable fertility to the earth with their castings (waste). If you don’t have worms now, add organic material as a remedy. Considered composting. Composting is basically decomposed material. It is the controlled biological and chemical decomposition of organic material. Composted material resembles black fluffy soil. Added to soil, compost improves drainage, increases aeration, and aids water retention and nutrients all of which create better root development resulting in healthier plants. By amending the soil, composting reduces the need to use chemical fertilizers. Homemade compost is economical to make. Compost provides a slow release of nutrients over an extended period. Compost can be mixed into the top 6-8 inches of garden soil or spread in a one inch layer around perennials. Instead of raking all of the leaves from your yard into the street, deposit them in a pile—or bin—in an obscure area of your yard. Mix in non-diseased stems and cuttings from your flower and vegetable garden. Add shredded or torn newspaper (do not use the colored sheets, however). Coffee grounds, potato peelings and egg shells can be used as well as leftover fruits and vegetables. Grass clippings and yard trimmings will decompose. Do not use cat litter. Lard, grease, oil, meat or fish bones may attract unwanted scavengers. Add water and stir. How much compost do you need? Incorporating two inches of compost into a 200 sq. ft. garden will require 33.33 cu. ft., or 1.2 cu. yds. or 41.66 bushels or 83.33 five gallon buckets. For an explanation of creating a compost bin, call the Linn County Master Gardeners at the Horticulture Hotline at 319-447-0647. Chrysanthemums are shallow-rooted plants. Repeated freezing and thawing of the soil during the winter months can heave plants out of the ground and cause severe damage or even death. Gardeners can increase the odds of their mums surviving the winter by applying a mulch in fall. Mulching helps eliminate the alternate freezing-thawing cycles that can heave plants out of the soil. Apply the mulch in late fall, typically late November/early December. Do not cut back the plants prior to mulching. Simply cover the plants with several inches of mulch. Suitable mulching materials include clean straw, pine needles and evergreen branches. Leaves are not a good mulch as they tend to mat down and don’t provide adequate protection. The mulch should remain in place until early to mid-April. Normally, I don’t like to swear, but ARRGGHHH…. and #$@##!!! The last day for gardeners to work in their city-leased plots in Cedar Rapids is Sunday, Oct. 19, but that isn’t what got me riled. Parks workers will begin tilling garden plots at Tuma, Ellis and Squaw Creek parks on Monday, Oct. 20. All produce, stakes, wire and plant ties must be removed by Sunday. It’s always sad to see the end of the gardening season, but it’s even more upsetting to have something taken by garden thieves. That’s what I discovered last night at my city-leased garden. Someone had taken every single one of the cabbage heads that I had planned to pick last night. The Grinch didn’t leave a single one! It was clear that it wasn’t a hungry critter by the clean knife slices on each of the plants; plus, at least the wildlife doesn’t hog everything, as this person did. I don’t mind sharing my veggies. In fact, I get the greatest sense of satisfaction in doing just that when I can donate to our local food pantries. But having someone take something without asking is low. I know it happens occasionally at some gardens and quite often at others. It’s happened to us before, with sunflower heads and pumpkins, but cabbage??? And even though I doubt the thieves will be reading this, I have some suggestions for them. 1) Ask first! There’s a good chance that many gardeners will gladly give you what you need. 2) Don’t take everything. Chances are, I wouldn’t have missed a few heads of cabbage, or tomatoes or whatever else has been taken. But to steal everything is downright greedy. 3) Change your ways! Click on the food pantries tab on this blog and find a place to donate those vegetables you took. A final thought: since some gardeners do abandon their plots before the final day of the season, there is likely good produce that goes to waste. Perhaps the Cedar Rapids Parks Department could allow “open harvesting” on the day after the gardeners have to leave.